Happy July! Can you believe it's July already? I can't. June seemed to fly by in a flash. I really hope the rest of the summer will slow down a bit so the boys and I can enjoy it before it's time to start school again! So this month marks something new for me. A new project I recently became involved in called the Blogger Recipe Challenge. To learn more about the Blogger Recipe Challenge visit the site here. Basically each month there is a new theme and each blogger that participates has to come up with 10 unique recipes to share. 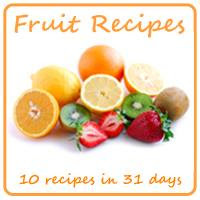 With 10 of us participating, you get 100 new recipes! The theme for July is fruit. We can interpret this theme in any way we like, so the first recipe I'm sharing is my chocolate chip pancakes with warm banana syrup. I make these pancakes all the time for the boys but the syrup was something new I created. Boy oh boy was it good. It is definitely thinner than your traditional syrup, but it's super rich and delicious. Try it on any of your favorite pancakes! Start by making the banana syrup. Mix all of the ingredients except the bananas in a medium saucepan. Bring to a low boil then add the the bananas in and mix gently. Allow to simmer gently while making the pancakes. For standard size pancakes, pour about 1/4 cup of the batter onto a hot buttered griddle or large skillet. Sprinkle a handful of the chocolate chips over the surface of each pancake. Cook over medium heat until the pancakes start to bubble and the edges are starting to brown, about two minutes. Flip and cook on the other side for another minute or two, until golden brown. To keep the pancakes warm while the rest are cooking, I put them on a plate in a warm oven, usually set at 200 degrees. Once they are all cooked, spoon some of the banana syrup on top, making sure to get plenty of banana slices too!